Coconut oil contains a unique form of saturated fats known as medium-chain triglycerides. Unlike other saturated fats, MCTs provide an energy source for the body, rather than being stored, according to "Supplements 101" by Jim Stoppani. The fats contained in coconut oil may also help to boost thermogenesis and/or fat burning in the body. You can take either organic virgin coconut oil or isolated MCT supplements extracted from coconuts. Follow a few guidelines to add coconut oil to your fitness program. Spread 1 or 2 tbsp. coconut oil onto toast in the place of butter in the morning to start your day with an energy boost. Coconut oil remains solid at room temperature, but will partially liquefy like butter when its spread on warm toast. For a tasty addition, sprinkle calorie-free stevia and cinnamon on top. Mix 1 tbsp. 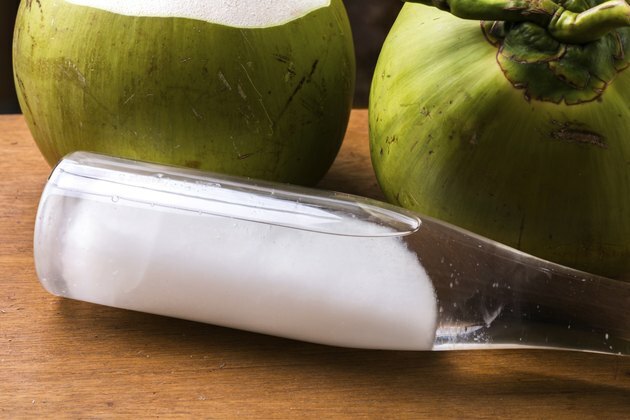 coconut or MCT oil into the water or sports drink that you consume during your workout. You will feel the energy almost immediately. "Homemade Supplement Secrets" author Jeff Anderson recommends taking MCT oil 30 minutes before working out. Add 1 or 2 tbps. coconut oil to your post-workout meal. Not only do healthy fats like coconut oil help to burn fat, they also promote hormonal balance and muscle recovery, according to "Optimum Anabolics." Take coconut oil soft gels if you cannot tolerate the taste and mess of the oil. Most health retailers carry coconut oil in supplement form. You can take 1 to 3 g with each meal to sustain high levels of energy all day long. Blend 1 or 2 tbsp. coconut oil into a protein smoothie between meals to ward off hunger, burn more fat and keep energy levels high. Combining whey protein with coconut oil in these shakes forms a potent synergistic formula for building muscle and burning fat. Cook chicken, steak, fish or other meats in 2 tbsp. coconut oil. The fats in coconut oil are highly resistant to heat, making them ideal for frying because they do not easily lose their chemical structure like other fats. For example, some cooking fats transform into dangerous trans fats when heated to extreme temperatures. Drizzle melted coconut oil over desserts or add it to coffee in place of cream. Healthy fats can help to buffer insulin-spikes that would otherwise promote body fat storage. Adding them to meals can keep your energy high and help you stay lean. Replace other saturated fats with coconut oil, rather than using them together, since the total increase in calories could lead to weight gain. Do not add saturated fats to your diet without first consulting with your doctor if you are at risk for heart disease.